Pencils down! It's time to see how you did on our ecology pop quiz. 1. Use your Internet research skills to learn a little bit about Ngorongora Crater in Tanzania, then find the site in Google Earth. Can you find the safari vehicles? Large animals? What kinds of plants do you think are growing along the shores of the lake? What kinds of plants would you find along the crater rim? Yes, you can see safari vehicles and some animals (probably elephants) in the Google Earth imagery as you scan around the roads that run through Ngorongoro Crater in Tanzania. 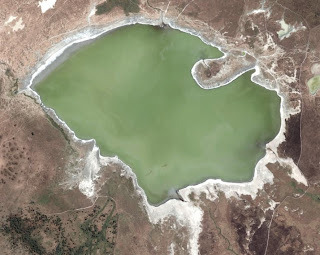 As for the plants in this area, the shores of the lake are white in the imagery, indicating that this is a saline lake with salt residue around the edges. Therefore, we might expect to find halophytes (salt adapted plants) growing around the lake, and broadleaf trees that are more typical of a tropical ecosystem growing around the crater rim. 2.Judging by the characteristics of the trees, what time of year do you think the picture was taken over Central Park in Manhattan? In Central Park, the grass is bright green, about half the trees are green (having leaves), and the other half are brown (with no leaves). The grass is green because it is irrigated, and the evergreen trees (such as pines and other conifers) would be green all year round. But, the additional presence of leaf-less, deciduous trees indicates that this imagery must have been taken sometime after the leaves changed color in the fall, but before they re-emerged in the spring. So, sometime in winter is a good guess for the timing of these photos. 3. John Muir described a few trees growing on the top of Half Dome in Yosemite Valley when he visited there in the mid-1800s. 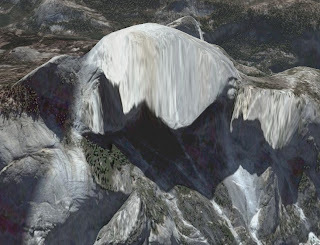 Are there any trees still growing on the top of Half Dome? Sadly, no trees remain on top of Half Dome; they were all cut down for firewood while hikers were still allowed to camp on top of the dome. 4. The Tigris River flows through central Baghdad. Is there any vegetation growing on the islands and sand berms in the middle and on the edges of this river? Yes, there is clearly vegetation on the sand berms and islands along the Tigris River in Baghdad. These plants don’t really look like trees, but are probably bushes and small marsh plants. 5. You’re considering accepting a plant biologist job that would require you to survey the vegetation on the shores of Prince William Sound immediately outside of the small town of Valdez, Alaska. Are you going to be working in the trees or in more open vegetation? 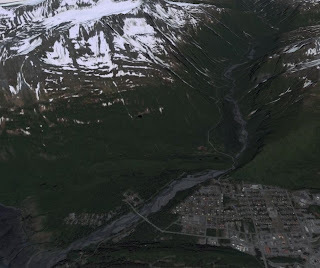 The Google Earth imagery shows that the terrain around Valdez, Alaska is a mixture of dense conifer forest and more open shrub-lands. If this wonderful plant-biologist job also included surveying the high mountains around Valdez, we would be working in a treeless, high-alpine environment. Sounds like fun to me!